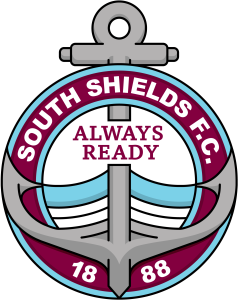 South Shields Academy produced a superb performance as they secured a league title in a showdown with Tyne Metropolitan College on Monday. The young Mariners went into the game knowing they needed to take all three points to win Group C of the ECFA Premier League. It was a high-pressure situation but they rose to the challenge brilliantly to secure the academy’s first piece of silverware since it was formed in the summer of 2017 with a 4-1 win. Tyne Met would have won the title themselves had they beaten Shields, while a draw would have handed the championship to Monkseaton High School. The game – held at North Shields FC’s Daren Persson Stadium – got off to an even start but Shields almost fell behind in the sixth minute when a shot was destined for the top corner before goalkeeper Aaron Steavens pulled off a stunning one-handed save to tip the ball onto the bar. The J Shipley & Co Heating Ltd-sponsored young Mariners cleared the resulting corner and raced down the other end as Michael Colquhoun got in behind, but he pulled his effort just past the post. Shields broke the deadlock in the 11th minute after a great bit of work from Joe Lockey on the left as he beat his man before delivering a cross which Will McCamley was able to stab home from close range. It was almost two when McCamley and Colquhoun combined before another McCamley shot was deflected just wide. The corner which followed resulted in goal number two as Josh Elcoate curled in a terrific delivery and Colquhoun nodded it in at the far post. Colquhoun was getting plenty of joy running in behind and almost added his second when he raced onto a ball from Lockey, but this time a decent save denied him. He turned provider soon after when he again sprinted in behind before this time teeing up Olly Scott, who was only kept off the scoresheet by a tremendous save. Tyne Met were reduced to 10 men at the end of the first half when Scott was scythed down by a poor challenge which forced the Shields forward off injured. The game was of a physical nature but Shields stood up to the challenge well, with Stevie Black particularly combative in midfield as he covered lots of ground and produced countless well-timed tackles. The young Mariners almost scored their third three minutes into the second half, but Colquhoun was just unable to get clean contact on a McCamley cross. McCamley was the next to go close when Ethan Biwer played him in and he showed good strength to hold it up, but was unable to force the ball past the goalkeeper. The third goal did arrive on 67 minutes when Bailey Judson swung in a tremendous corner from the right which beat everyone before nestling in the net via the post. McCamley eventually got his second of the afternoon 15 minutes from the end when Judson got in on the right of the area before his shot was parried, with McCamley on hand to head in the loose ball. Tyne Met pulled a goal back a minute before the end but that did little to dampen the Shields celebrations. SSFC Academy: Steavens, Yembe, Lockey (Croft 71), Biwer (c), Patterson (Errington 71), Onarbay, Black, Elcoate (Dunn 71), McCamley, Scott (Carney 45), Colquhoun (Judson 62). Goals: McCamley (11, 75), Colquhoun (14), Judson (67).